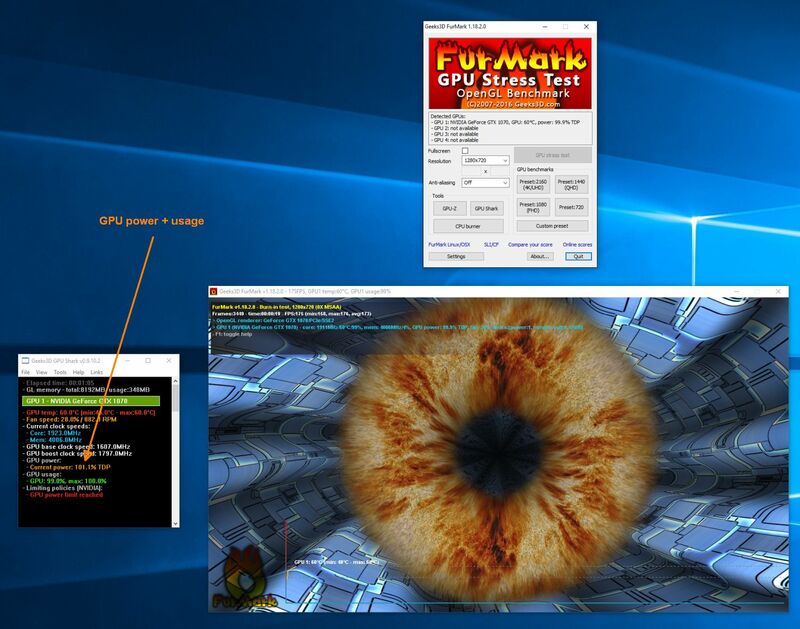 I've encountered some isues with my setup lately and run the FurMark GPU Stress Test to test my graphics card. When running the FurMark in Fullscreen with 1920x1080 resolution the temperature of the GPU is about 70°C (where the cards max temperature is 98°C according to nvidia) and the water cooled cpu's about 50°C. Now here's the thing: When the furry donut is rendered, the stress test runs stable, but if i hit space to "toggle furry object rendering", the gpu makes some squealing noises, the temperature drops slightly and next the system shuts down completely. No blue screen, just a power outage. Even though the system logs are enabled, no log is written out. That doesn't make any sense to me, can somebody please tell me what is going on in the FurMark algorithm, when the fur rendering is toggled? As far as I understand the situation the fur rendering is quite an expensive technique, so by disabling it the card should have actually *less* to compute, why would it crash then, and not under maximum load? As the temperature should not be an issue, I first suspected my PSU but it is an Corsair VS650 (650W power supply), the gtx only requires 500W and the wattmeter I installed never shows a power usage > 350W for the whole system. I am absolutely clueless about what is going on here. If anyone has any idea what else I could try to diagnose the problem or has any insight about what FurMark is doing when the fur rendering is disabled, please let me know. 3. normal mode and install new driver. A GeForce GTX 970 has a power consumption around 150W - 200W. The Corsair V650 should do the job correctly. Thanks for the replies. I tried nuninho1980's approach, uninstalled the nvidia drivers, ran DDU in safe mode, installed the newest whql driver and started FurMark again. The furry rendering stable for 30 minutes (74°C in automatic fan mode, total system power usage 350W), then toggled the fur rendering. Interesting thing: coil whining again but ran stable for a few minutes. Turned on fur rendering and the system crashed instantly. When fur rendering was disabled, the power consumption decreased from 350W to 272W, maybe it is the promptly switchover, that would hint towards a psu fault, wouldn't it, now that driver issues are less likely. I'm having the same problem. Did you try a new PSU? Did that fix it? Replaced my Corsair VS650 with a be quiet! power zone 650 and the system runs stable since. I am having the same problem. Did changing PSU solve the problem in long term? I bought a new power supply and computer does not crash anymore when I am pressing spacebar while furmark is running, like it did crash every single time with old PSU. I need to do more testing, but looks that I had same problem as the original poster.